In this post I have uploaded the notes I made for painting the German Asia Korps gun crews for my The Wind And The Lion TSATF game that I ran with my buddy Nick Zizo. We took this game on the convention circuit and ran is many times at cons like the first ever Colonial Barracks con run by the Broms in NO to the two HMGS-South cons in S. Fl. We built custom terrain, converted existing figs, and painted available figs to portray the troops in this classic movie. 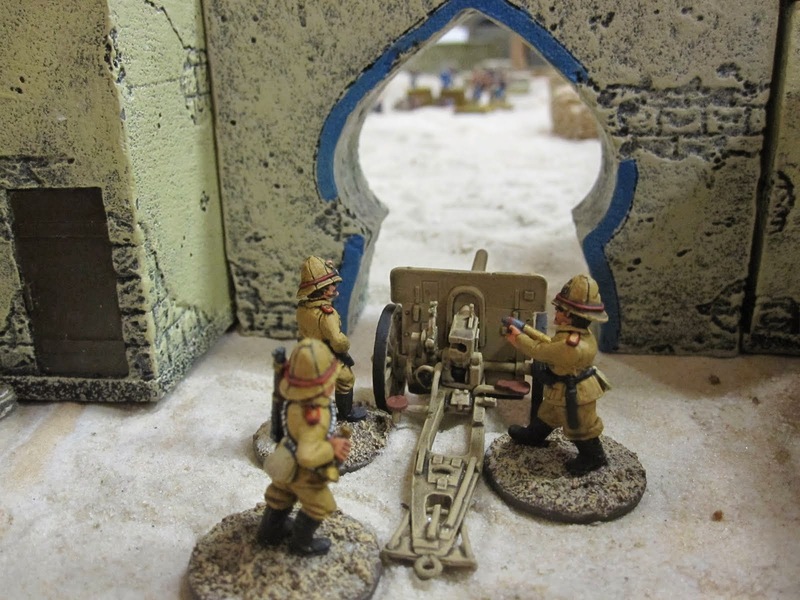 Most of the troops and weapons are accurate for the nations and time period of Morocco in early 1900. 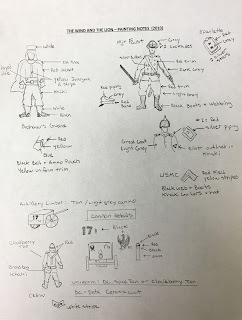 Painting notes for the German Asia Korp gun crews. I've painted (2) gun crews to represent some of the troops that are present in the last climatic battle scene. 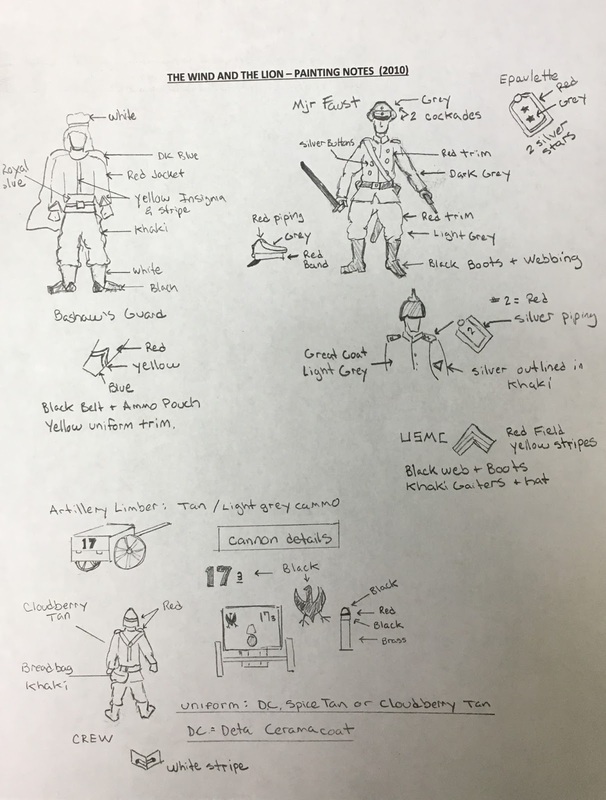 One crew was made up of converted 25mm Old Glory German Sea Battalion figures from their Boxer Rebellion line. The rifles were removed, arms altered, and artillery shells were glued into their hands that were made with thick brass rod that was filed and formed into breach loaded artillery shells. Based on my research at the time in 2010 I found that the HE or Canister rounds had a black warhead with a red band painted around it denoting the type of round. Unfortunately I cannot find that source, so until I do find it or until someone more knowledgeable than I corrects me I will leave the shells as is. I used Delta Ceramacoat's Cloudberry Tan for the uniforms and sun helmets painted on figs that were primed in flat black spray paint. The bread bag was painted Polly Scale acrylic Linen. The boots and webbing are Polly Scale Flat Black.Once the entire figure is dry I brush on my sealer and weathering mix, Polly Shades MinWax "Tudor Stain". This both weathers and protects the figs. I let this dry for 24 hours and then spray it with Testors "Lusterless Flat" to remove the shine and further protect the figs. The second Asia Korps gun crew was made using the now OOP Lead Boiler Suite Company German WWI / Colonial troops slightly converted by adding artillery shells or ammo boxes in their hands. The paint jobs are the same. The bases are simple 3/4" or 1" round steel washers that are coated with a gel product mixed with sand and small ballast rocks. 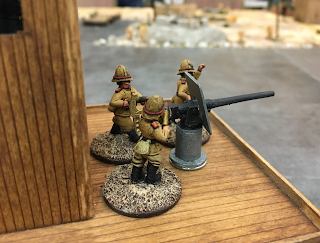 Here is a shot of the Old Glory Sea Battalion gun crew manning a forward artillery piece aboard a gunboat in another TSATF game loosely based on TW&TL entitled The Hun The Frog & The Lion.